Tehran Grand Bazaar is not only the city’s biggest, but it’s also the largest bazaar in the world. While the bazaars in some Middle east or African countries are very touristy, well adorned and exotic, with beautiful decorative artifacts, the Grand Bazaar is more down to earth, and is a true huge local market, where locals trade gold, paper, food, copper and everything else. Historic, expansive, and crazy Tehran’s Grand Bazaar is all about bargaining. It consists of more than 10 kilometers of flexuous covered alleys, which will confuse you definitely. The nearly endless maze that form the bazaar is the perfect place to get lost. Here the more you walk around, the more you have to walk. But there is nothing to be worried about, because you will always find a helpful local to explain you how to get somewhere or who will even walk you to the next exit, just out of pure helpfulness. It is divided up into sections selling different types of every imaginable product; of particular note are the jewelry and carpet sections. 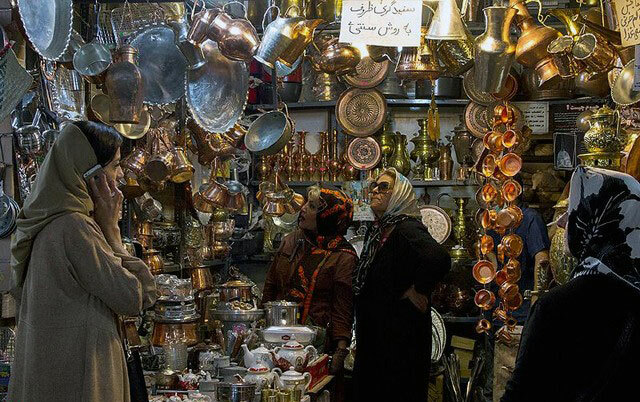 The atmosphere shows you Iranian market life immediately. There are plenty of tea-houses and restaurants around and inside Bazaar. The Grand Bazaar is located in the south part of Tehran, near many important attractions, including the Golestan Palace complex. If you plan to get there by Metro (which is the best way for this), you have to take the line 1 (the red line) and take off at Panzdah-e-Khordad station. Don’t forget to have your lunch at Moslem restaurant at the beginning of Bazaar ( you won’t miss it, there’s always a big line in front of it because they have the best Tahchin in Tehran). Go find Haj Ali Darvishi teahouse, number 78 in the clock sellers section. It’s the smallest teahouse in Tehran (less than 3 or 4 square meter). You have to drink your tea while standing in front of the tea house. He will treat you like kings and queens and will give a memorial coin at the end! The Tajrish bazaar, in the northern parts of Tehran, is one of the oldest areas of Tehran, and is close to Emamzadeh Saleh Mausoleum as well as Velenjak, Darband and Darakeh mountain resorts. The name Tajrish is driven from the language of Tat which was the official language of Shemiran before choosing Tehran as the capital. It was built according to architectural styles of other traditional bazaars in Tehran. Usually, travelers will find it more tourist-friendly and aesthetically pleasing than the central Grand Bazaar. It is a great venue for a spot of afternoon shopping, relaxing, drinking a coffee and enjoying the weather and the view of mountains. Boasting a vibrant central section selling fresh fruit and vegetables, as well as traditional Iranian sweets, the other alleyways of the bazaar peddle everyday items alongside traditional crafts and touristy goods. 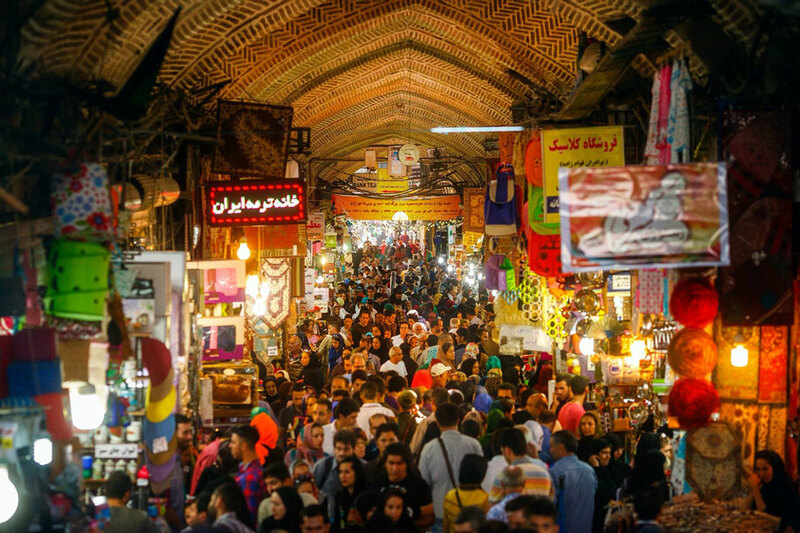 The Bazaar backs onto the picturesque Imamzadeh Saleh shrine, a popular local pilgrimage site, and also houses an excellent value kebab restaurants and teahouses. An interesting point about this market is the name of each store which is carved on the stores’ façade by tiles that has made a beautiful appearance to the market. The bazaar is covered and has many passage ways leading to different sections where you can purchase goods. Spices, dairy, clothes, fabrics, nuts & dried fruits, traditional cookware, fruits, veggies and … can be found in Tajrish Bazaar . Among all these stuff, the fruit & vegetable market is one of the most popular attractions of the bazaar. The beautiful historical Emamzadeh Saleh shrine is located adjacent to the bazaar, with access from inside. At the entrance to the shrine, people hand out sweets and dates to seek peace for their gone beloved ones. The Tajrish Bazaar is located in the north part of Tehran, near Tochal mountains, Darband, Darakeh and attractions, including the SaadAbad Palace complex. If you plan to get there by, you have to take the line 1 (the red line) and take off at the first station (Tajrish). And if you are already in Vali-e-Asr street, you can take the busses going all the way up from Railway station to the Tajrish square. Opening hours in Tajrish Bazaar is 8-9 AM and stores close at 10PM in Summer&spring and 9PM in Winter&Fall. Don’t forget to have Ash or Halim in Seyyed Mehdi Ash store. It’s one of the bests. Try some Kebab in Shemroon Restaurant. Their quality is good and you can have the best view of Tajrish square. Grab your coffee from Lamiz and walk down the Vali-e-Asr street till you reach Ferdows Garden. You won’t regret it.